The Chapman is a roomy, dignified ranch-style home that sports all the necessary comforts for urban living. The home occupies a total of 4,990 square feet, while the finished interiors have a floor space of 3,279 feet. The spacious master’s suite, which is the highlight of the two-story build, comes with its own master bath complete with a tub and walk-in closet. Built around the master’s suite is a nook for leisurely lounging. 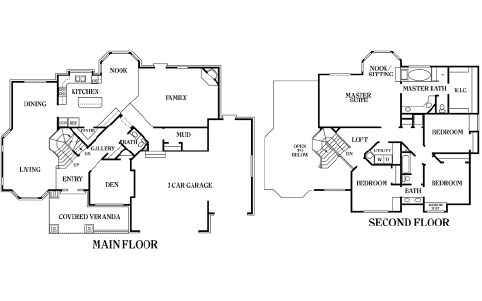 Adjoining the second story’s biggest room are 3 other bedrooms and another bathroom. The Chapman’s homeowners will also feel the generosity of space in the first floor’s living room, den, shared bath, kitchen with nook area, covered veranda, and three-car garage. New homeowners can realize the dream of living in a home like the Chapman with Perry Homes Utah. Our team has been in the home building business for 40 years. Across that timespan we have pleased numerous families with our beautiful designs, efficient construction process, and attentive customer service even for post-construction concerns. Rest assured, going through the construction plans will be a breeze for you, as you’ll be partnered with a design specialist who’ll clarify any outstanding concerns that you have—and moreover, make you feel welcome during the planning process. Call Perry Homes today for info about the Chapman, which is a tasteful but affordable living option for you and your family. Reach out to us at 801-264-8800 and start building your dream Utah home with us.